To me it looks more like John McCann or even Johnny Watkins ! I appreciate we lost but there is not even a report on the Plymouth game yet ! It's 12 since 23/12/2017 but go back to (just) 14/10/2016 and there was a run of 13 !! The last one at home before Flint was Jevons on 03/12/2006 in the FA Cup 2nd round against Gillingham (who else !). Result 4-3 Showunmi got the other goal. Hi HC I can confirm that David Rodgers did go to Cotham Grammar School. trainer prior to Buster Footman...? Les Bardsley was also caretaker manager for short periods in 1958, 1960 and 1967. 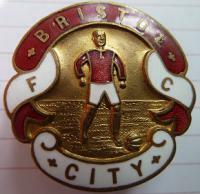 I have share certificates from 1982 (10 Supporter's Shares) and 1996 (30 Supporter's Shares) (as pictured above) both in BCFC (1982) Plc but now appear to have 400 shares in Bristol City Holdings Ltd. If you wish to check your share holding go to Companies House website and search on "Bristol City Holdings Ltd". Click on the "Filing History" and view the PDF dated 19th December 2016 "Statement of capital following an allotment of shares on 22 November 2016". It is 224 pages long but seems to be in surname order. I also have a 4 page A4 document titled "Notice to Share Subscribers", "Share Subscribers Roster 1996" which states : "Subscribers to the Share Issue which took place at the start of the 1996/97 season will have their names featured on a commemorative plaque to be commissioned by the Club and positioned in a designated part of the ground". It then lists all the names over the 4 pages.